Total electrics and air conditioning Melbourne is fully owned and operated Australian company and has been in the air conditioning and air conditioner installation industry for over 11 years. We supply Melbourne wide with a great range of air conditioning Melbourne needs which includes high wall split system inverters, multi head split system inverters, refrigerated ducted systems, refrigerated cassette inverter systems and window box air conditioners. We can offer competitive quotes for cheap air conditioning Melbourne zone. Total electrics and air conditioning stocks all the top brands. 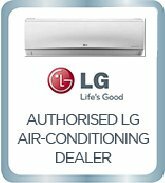 We are also one of Melbourne’s biggest LG suppliers. Why?